Hey! All you Star Trek Fans out there...Check this out!!! This is a hand carved, hand painted Nebula Class Starship...the U.S.S. Sentry. Check out the detail on this aircraft!!! The customer was blown away, when he saw how detailed the paint job and the engines were. 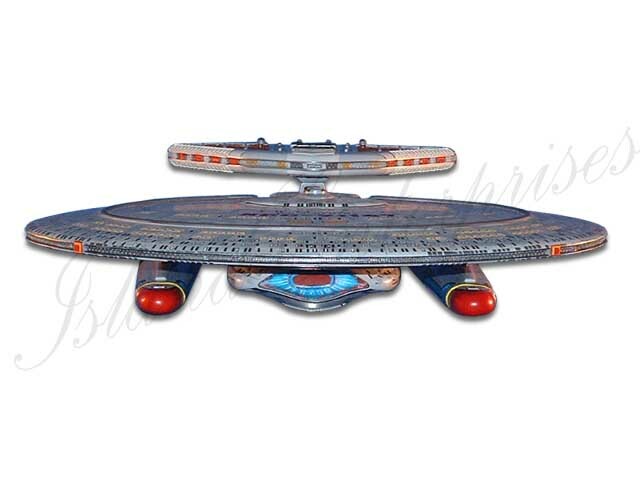 We can make a replica of any of the Star Trek Starships, with any customization you wish. We can also make any style of customized base for you, with any choice of carved and painted logos and text. AND REMEMBER!!! We offer a 100% money back guarantee if you are not totally convinced you have bought the most accurate and highly detailed product available on the market!! !